What is a Hybrid Heating System, and Why are They Popular? If you’ve been researching heat pumps or package units for your Charlotte home, then you’ve likely come across the term “hybrid heating” or “dual fuel capability” several times, and may be wondering what it all means. Just what is a hybrid heating system and why are they so popular? In this article about Charlotte HVAC Systems, we’ll walk through some of the ins and outs of Hybrid Heating for your home, and hopefully start to answer those questions in your mind. If we leave a few open ends, feel free to ask more about hybrid heating in your Charlotte home at the end of the article. In a standard heat pump split system, the condensing unit serves as the air conditioner in the warm months and the source of heat in the cool months. 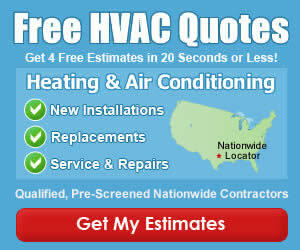 The indoor part of a standard heat pump split system is an air handler. An air handler does not produce heat by itself, though some have small electric heat strips installed in them to produce auxiliary heat. In a hybrid heating system, rather than an air handler, a gas furnace makes up the second half of the split system. The homeowner has the choice of using the heat pump or the gas furnace for heating – and that is why they are also called dual fuel systems. 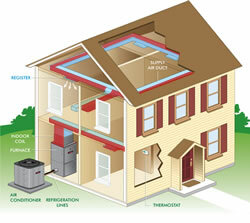 The heat pump uses electricity for heat; the gas furnace uses natural gas or propane for heat. Learn more about the standard definition at Wikipedia. As we mentioned in the section about how a heat pump works, we learned that the heat pump can reverse itself and instead of removing the heat from your indoor air thus providing ac or cooling, it can remove the heat from outside air very effectively, down to about 30-35 degrees outside. When it gets down to the 32 degree mark, (or whatever set point you program into your thermostat) an outdoor sensor sends a signal to your thermostat, turns off the heat pump condenser and tells the gas furnace to start-up. Why are Hybrid Heating Systems Popular? Many consumers choose a hybrid heating system for the versatility it provides them. Dual fuel capacity gives them the choice of using the fuel that is the most cost-effective at any given time. In some colder regions of the country where natural gas is more expensive, people have turned to heat pumps to use the cheaper electricity to heat their homes. Secondly, in cooler climates where winter temperature often dip below freezing, a gas furnace is more fuel-efficient than a heat pump. Heat pumps work well down to about 30-35 degrees and then can be ineffective, so having a gas furnace is essential. Hybrid heating systems do cost a bit more than standard split systems. In fact, in some areas, contractors have been known to charge 2-3 times more than a standard unit, simply due to the lack of understanding of how they work. Their value comes in the comfort they provide to homeowners, and where temperatures get very cold in the winter, they will save on energy costs too, making Hybrid heat the common choice for people who want to go green with their home HVAC. Take a look at today’s quality dual fuel, hybrid heating systems from the top manufacturers. You’ll be impressed by the quality, indoor climate control, and energy efficiency they provide.